Dr Eleanor Gates-Stuart invited composer, Marlene Radice, to create the music for the StellrScope exhibition at Questacon. A challenging task given the range of content throughout the science-art works (hemisperical domes, 3D volumetric display system, holograms) relations to wheat crop science and the legacy of experimental scientist, William Farrer. “In creating a piece of music which would serve as a backdrop to the StellrScope exhibition, I sought to write and produce music which was as true as possible to the concepts which underpin the artworks. I began the piece taking heed of the notion of the visceral experience of wheat within its natural environment by experimenting with organic sounds. This presented a chronology of the means by which wheat is processed and harvested, from the field to the mill, to the factory. These natural sounds were then edited and overlaid upon one another to produce a cacophonic sound-scape which sought to emulate the dual concepts of wheat development, in its cyclic and expansive means of proliferation throughout a century. The piece uses a palindromic structure based around a cyclic use of musical cells. 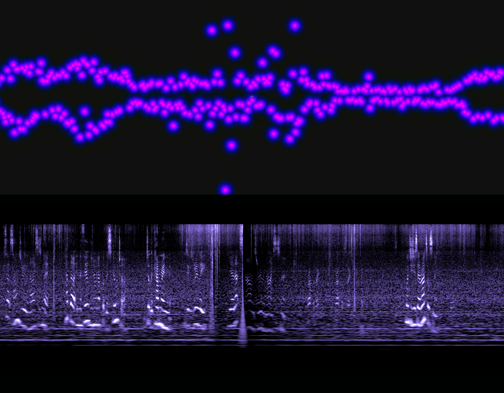 These cells are made up of 1-3 bar phrases which are built upon and repeated throughout the piece. The pitches used in these cells are based around the wheat nucleotides of Cytosine, Adenine and Guanine, with the first letter of each of these nucleotides, A, C and G, used in rhythms based around the wheat genome sequence. I sought to use a combination of alleatoric musical ideas as well as more intuitive ones in order to further highlight the amorphous binaries of traditional and electronic music, used in tandem with the binary relationship concurrent with contemporary society’s relationship with plants and food production.